Jusef’s story is a testament to the extraordinary path the journey of life can take when one dares to hope, showing above all, that some dreams are worth chasing – even if doing so does prove to be An Odyssey in Blue. With contributions by Stuart Polson and Stephen Raw. This is a remarkable book. Transporting us to unseen cultures and forgotten times, An Odyssey in Blue chronicles a young man's journey through life with honesty, wit and colour; from the bustling streets of post-colonial Marrakesh to Brussels in the summer of love, each step is vividly woven together with alluring subtlety and skill. Labaki writes like a poet. With deceptive simplicity, he challenges the ordinary conventions of storytelling, weaving together the beauty and mystery of the ordinary made extraordinary. 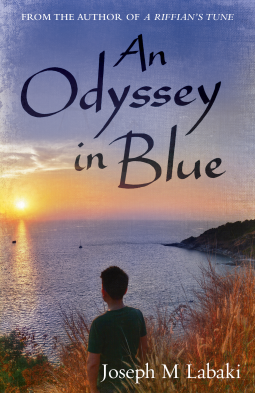 At times both whimsical and philosophical, An Odyssey in Blue reads on some level like a novel of ideas, a novel of hope and above all, a novel of life. An outstanding achievement.